Waynesboro is a city in Augusta County located in the Shenandoah Valley, near many important historical markers of the Civil War and Shenandoah National Park. A portion of Interstate 64 falls within the city limits of Waynesboro, and the Blue Ridge Parkway, Skyline Drive, and the Appalachian Trail are less than five miles away. The town is perhaps best known for being the home of P. Buckley Moss, the artist, and the P. Buckley Moss Museum. 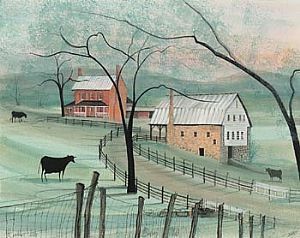 Baylors's Mill, a painting by P. Buckley Moss, who is inspired by the Shenandoah Valley, the Amish and Mennonite people who live there.